Writer/director J.J. Abrams' (Mission: Impossible III, Star Trek) Super 8 is a love letter to producer Steven Spielberg's early filmography, particularly family oriented sci-fi classics like Close Encounters of the Third Kind and E.T. Even more so, it plays like a children's adventure in the mould of The Goonies (also produced by Spielberg) and other Amblin Entertainment films. You can see Abrams' intense affection for his idol's early work and the pure cinematic nostalgia of every frame composed down to the pulsing musical score by Michael Giacchino. All the Spielberg trademarks are there from father issues, family tragedy, coming of age themes, mysterious monsters, and intense friendship through shared grief. The cast of young newcomers is excellent, especially stars Joel Courtney and Elle Fanning (Somewhere), who are superb. Fanning is stunning and clearly a star as she wows us with her effortless emotions and even acts well while pretending to act in a very meta scene. Kyle Chandler (Friday Night Lights) plays the grizzled, detached father and town deputy sheriff well as his small Ohio town goes through a series of perilous events. As the title suggests, the film centres around early home filmmaking techniques between these youngsters making a zombie short film amidst a mysterious, monstrous epidemic, and series of catastrophes. Super 8 is a nice parallel to the Abrams produced Cloverfield monster movie, a more larger than life, singularly focused experience. Here, instead of handheld shaky cam, Abrams fully uses many cinematographic techniques to craft a purely visual storytelling experience. Despite all the lavish and stunning visuals, the writing and pacing are sometimes uneven. Super 8 never finds firm footing between its action and emotional scenes of character and whimsy to fully flesh out its familiar story. While the filmmaking feels very nostalgic, the storytelling is too contemporary at times with crashing action between character moments. The balance of Abrams and Spielberg's styles isn't always successful. I wanted more of Abrams and less of Spielberg. Abrams as a director continues to impress with his sharp direction and vision, but surprisingly, despite his long history as a television writer/producer, his script lacks a certain heart and emotion in story to match up with the strong character performances. Scenes are intercut too leisurely without a forward momentum like the films Abrams references. Abrams never quite brings the film's two storylines together between the boy's family struggles and the discovery of a monstrous creature. While the central kid characters are well developed enough, some adult interactions are flat and not fully conceived as the film races to a visually magical climax. Unlike with his Star Trek reboot, Abrams doesn't bring enough of his own filmmaking sensibilities and storytelling tricks, despite writing the script himself, to shape enough of a fully formed feature. I felt Abrams just lacked a certain ingredient of whimsy to complete his cinematic love letter. Nonetheless, it proves to be an admirable filmmaking venture. 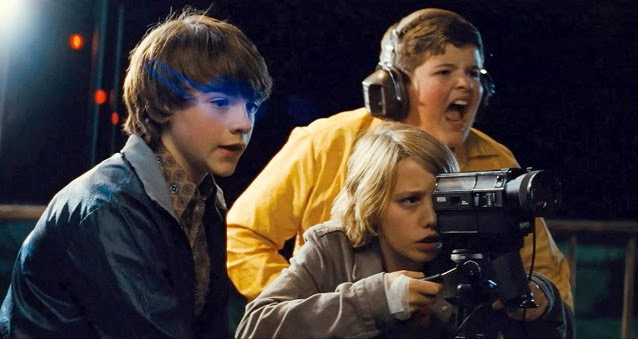 Super 8, a pure homage to the adventure and alien classics of the 1970s and '80s at its finest, is a fun, action piece of pure nostalgia. However, it doesn't have quite that magic or spark that charms us as much as Spielberg's originals. It's too much nostalgia and not enough of its own full or rich cinematic experience.